The USDA loan program, also referred to as the Rural Development loan, or Rural Housing Loan, is a unique loan product offered by the United States Department of Agriculture (USDA). It provides qualified borrowers with zero down payment, 100% financing at minimal up-front cost. To qualify for a USDA loan, applicants must satisfy several specific USDA requirements, although these requirements are typically much less stringent than those for conventional loans. There are two types of USDA loans - USDA Guaranteed Housing Loans and USDA Direct Loans -, and each has unique requirements. USDA allows 100% financing with no down payment required.Closing costs and pre-paid items may be included in the loan up to the appraised value of the property. For instance, if your purchase price was $200,000 and the appraisal was $203,000 you could include up to $3,000 of your closing costs and raise your loan amount to $203,000. USDA qualifications include minimum requirements for borrower credit, although, as previously mentioned, these requirements are much less strict than credit requirements for conventional loans. For rural development loans, borrowers must have a minimum credit score of 580 to qualify. While a 580 is the minimum USDA will allow, most lenders will require at least a 620 or 640 credit score. In addition to property type, rural development loans include USDA restrictions in terms of borrower an. These loans specifically target borrowers with low to moderate income living in rural areas. As such, borrower income a to 115% or lower than the median income for the region in which the property is located. This limit is also based on family size, so a family of 5, for example, can make more money than a single person and still qualify. Visit the official USDA web site to check income requirements in the State and County you wish to purchase a home for that areas income limits. One of the main USDA loan requirements is that the intended property must be located in an area classified as “rural” by the USDA. While this restricts many borrowers from qualifying, the USDA definition of rural is fairly lenient and includes a large number of suburbs across the country. Generally speaking, anything outside of any large metropolitan area will likely qualify, but prospective borrowers can verify if the property meets this requirement by visiting the USDA official website. Debt-to-Income ratio (DTI) considers a borrower’s gross monthly income against his or her monthly debt. To prevent borrowers from obtaining mortgages larger than they can feasibly afford, the USDA restricts borrower DTI to 29%/41%. Slightly higher ratios up to 45% and even 50% may be accepted for those with a credit score of 660 or higher, and with excellent compensating factors, like stable employment, ability to save, and anticipated increases in income. 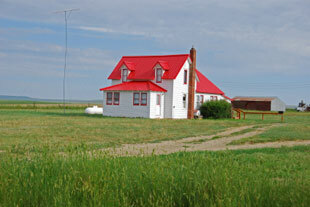 USDA rules specify that only certain property types are available for purchase with rural development loans. These property types include single-family housing including construction, modular homes, Planned Unit Developments (PUD’s), renovated homes, eligible condominiums, and manufactured homes. Additionally, USDA requirements state that the home should be “modest” in size, cost, and design. Homes with income producing elements, including rental units, mother-in-law apartments, or any farming activities, including tillable acreage are not allowed under this program. Properties that qualify for USDA rural development loans must not include any features that impact residents’ safety and the habitability of the property. Manufactured homes must be permanently installed and satisfy HUD Manufactured Housing and Construction Safety Standards, as well as HCFP thermal and site standards. Existing manufactured homes are ineligible for USDA loan purchases unless the home has already been financed with a USDA loan or is Real Estate Owned (REO) previously acquired with a USDA loan. USDA requires a 2% upfront guarantee fee and an annual fee. The one-time guarantee fee is 2.0% of the gross loan amount, and this amount is added to your loan amount. For example, if your base loan amount is $200,000 the guarantee fee would be $4,000, and your new total loan amount would be $204,000. The entire guarantee fee may be included into the loan above the appraised market value. The annual fee is 0.40% of the loan amount divided by 12 and paid monthly for the life of the loan. For example 0.40% of $204,000 is $816.00 / 12 = $68.00 per month. Even though USDA requires mortgage insurance, .040% is much less than alternate mortgage programs like FHA. When applying for a USDA rural development loan, borrowers must present standard mortgage loan documents, including proof of the last two-years income (W2's or tax returns), the most recent pay stubs for the last 30 days, and the past two-months bank statements. However, since USDA loans can finance up to 100% of a home’s purchase price, and the seller can pay their closing costs, many borrowers often do not need much money in the bank to qualify. If you have any questions about the USDA Loan program, visit our USDA Frequently Asked Questions page. In addition to the standard USDA Rural Development loan, the USDA offers a loan program known as the USDA Direct Housing Loan, which is tailored to borrowers and families with low or very-low income, the elderly, and people with disabilities. Also known as the Section 502 loan, the Direct Housing Loan includes several similar features to the Rural Development loan, including no down payment and no mortgage insurance requirement. As with its counterpart, Direct Housing Loans include lenient USDA qualifications, in comparison with other mortgage programs. For Direct Housing Loans, USDA requirements regarding location are identical to those for standard Rural Development loans; eligible properties must be located within areas designated as “rural” by the USDA, although many suburbs qualify. Borrowers must have low or very low income; defined by the USDA, low income refers to borrowers with income levels between 50% and 80% of the Area Median Income (AMI), while the USDA defines very low income as borrowers below 50% of the AMI. Borrowers must currently be lacking sufficient housing. In terms of credit, borrowers must not be able to obtain credit elsewhere but must have a “reasonable” credit history. Borrowers must have sufficient income to afford monthly mortgage payments (including insurance and taxes), which should not exceed 24% of total monthly income. Eligible property types for Direct Housing Loans include existing structures, new construction, manufactured homes, or renovated homes. As with Rural Development requirements, these homes must be “modest” in size, cost, and design, as defined by the USDA for that area. Furthermore, the property must not have a market value that exceeds the loan limit for that location. Manufactured homes must be permanently installed and meet HUD construction and safety standards, in addition to HCFP standards. Previously existing manufactured homes must be either currently secured by an HCFP loan, direct or guaranteed, or a REO (Real Estate Owned) structure previously financed with a HCFP loan, direct or guaranteed. All types of homes must comply with the voluntary national model building code, as per both the state and HCFP thermal and site requirements. The USDA Direct Loan funds may be applied to the purchase or preparation of approved properties such as sewage and water facilities, to building a new structure, to repairing, renovating, or even relocating an existing home.